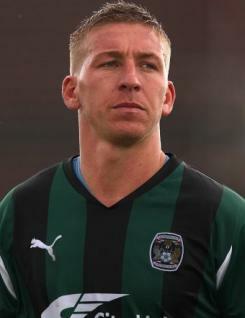 Freddy Eastwood had a very mixed campaign for Coventry City in 2010-11, his third season at the club. His brace on the opening day against Portsmouth showed his undoubted talent but after Marlon King's arrival it was clear that he was no longer first choice striker for the Sky Blues. He was involved with the first team all season but managed only 14 starts scoring five goals, although his skill and speed always threatened more. After being recalled to the line-up in January he had a golden spell, scoring three in three games but his form faded and he was soon back on the bench. A popular player with the fans, Freddy always threatened to explode into the form that made him a prolific scorer at Southend and when he does so he will become a massive hero with the supporters.